A large installed base of (connected) source points is what makes an IoT solution mainstream. Unfortunately, many devices were born to be offline, which poses an obstacle to joining the Internet of Things. We introduced the ProxToMe IoT Gateway, a tight System On Chip that runs our proprietary software to seamlessly bridge the gap between the physical and digital worlds, and drastically expedite your time-­to-­market. Plug-­and-­play, endpoint­-agnostic, it continually gathers sensor data from endpoints and generates actions based on input received. In a world that’s come to embrace the cloud, we realize that sometimes, information processing needs to be kept closer to the ground to make it faster and more secure. Enter Fog Computing ­- a new layer of infrastructure that exists between devices and the cloud that delivers the horsepower to deal with IoT data locally and shrouds sensitive information just as fog should. It handles mission-­critical IoT scenarios and helps us shortcut the process of collection, normalization, and analysis of data, thus reducing overall development time and cost. Fog is cutting­-edge and we offer access now. To us, making things smarter means making them do what they couldn’t do before. Our platform allows you to do just that, and more. A Device Management module helps you oversee your fleet of connected devices, deploy firmware updates, collect data, and integrate your device with new cloud services. A Service Provider Management module gives you all you need to have your device connected to third­-party providers and run their service on top or through your device. You focus on growing your business while we take care of the underlying technology and make sure that it works best for you. Handshaking is what individuals universally do to start a conversation. Sometimes, replicating the same experience with a smartphone against a smart device can seem trivial and creates vulnerability to new cyber attacks such as relay attacks. 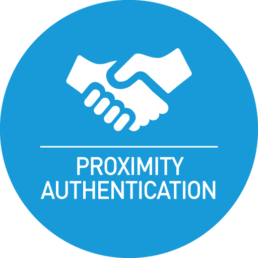 With ProxToMe, you get a unique technology for Proximity Authentication to IoT devices. We utilize Bluetooth/NFC and proprietary software to establish a trust between our smartphone and the IoT device. Fast, accurate, secure, and easy to deploy. With ProxToMe, users can access host devices by just keeping their phone in close range. As opposed to competitors building upon Bluetooth, NFC, QR code and Ultrasound, ProxToMe uniquely provides proof of proximity, full protection from relay attacks and contactless user experience all in one solution.